The Iron Chef returns to his grilling roots in this Ssequel to the his bestselling book Boy Meets Grill. Boy Gets Grill is set in Queens, on a rooftop in Queens overlooking the Manhattan skyline and celebrates the explosive flavors of his hometown's diverse neighborhoods. Thissquarely ins Bobby Flay's New York, and everywhere he goes, there is great grilling: from Chinatown to Astoria, Queens (Greek food); Arthur Avenue in the Bronx (for old-style Italian); and lower Lexington Avenue (better known as Curry Hill, for Indian); and the flavors go on and on. The question isn't “Can I grill this?” but “Is there a reason not to grill this?” Usually the answer is “Go ahead and try it!” Throughout, Bobby gets more and more out of the grill, making life easier and encouraging everyone to think big, have fun, and get their hands dirty. The grill is no longer for weekends only. 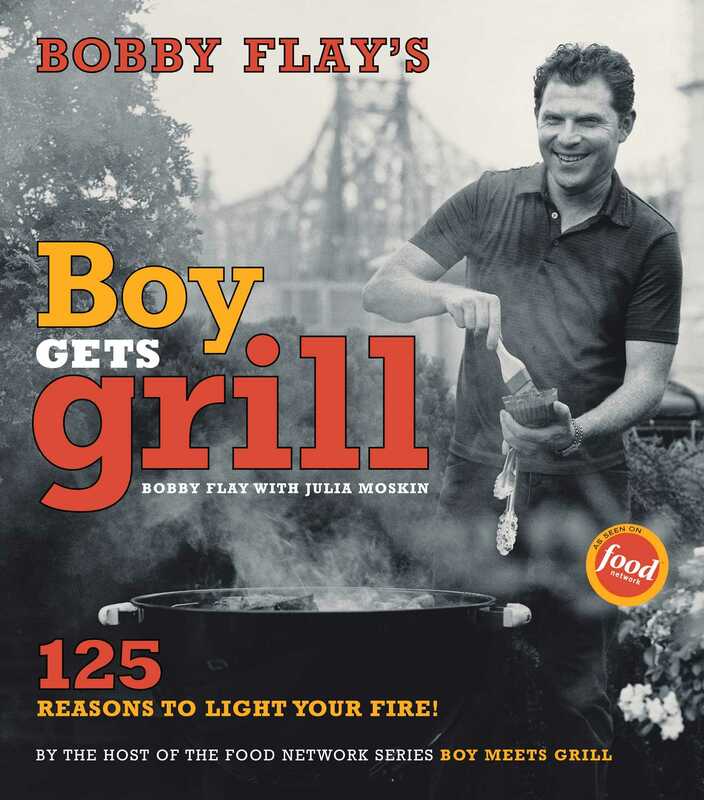 The recipes in Boy Gets Grill are the quickest and easyiest that Bobby has ever created, making the grill a perfect vehicle for busy weeknight meals. Flavors are (pleasantly) challenging. For the simplest of suppers, try Grilled Quesadillas with Sliced Steak, Blue Cheese, and Watercress; Grilled Shrimp with Triple Lemon Butter; Grilled Tuna with Red Chile, Allspice, and Orange Glaze; or a Pressed Cuban-Style Burger. Boy Gets Grill is also full of great ideas for entertaining and enjoying the company of family and friends. In the “Big Parties” section, Bobby takes hosts and hostesses through every step of preparation for a Fish Taco Party, Burger Bar, and a Skewer Party (perfect for backyard cocktail parties where one hand stays free to hold a glass). There are even recipes for brunch on the grill. The book includes cool drinks to sip while the fire gets hot, as well as appetizers, salads, simple desserts, and, of course, the meats, fish, and poultry that everyone loves to grill. Bobby also gives tips on what equipment you need to grill (and more important, what you don't); six simple (and decidedly low-tech) steps to test for doneness; how to gauge how hot your fire is; and Bobby's Guide to Steak. One day I woke up and realized that I had become permanently attached to my grill. How could this be? I am a native New Yorker who still lives in the heart of Manhattan. I didn't grow up with a backyard grill. I have yet to see a grill fired up in the middle of Times Square or in front of the Empire State Building, so I couldn't have just picked up my love for outdoor cooking around town. Open-flame grilling, as well as propane tanks for gas grills, are pretty much illegal here in Manhattan. But, in fact, there's a lot of grilling that goes on in the city. Manhattanites have been secretly grilling for years. I have been to some fabulous parties on some of New York's most picturesque terraces, where the grill, as always, was the life of the party. But we guerrilla grillers don't talk about it a lot. Until now. Starting with trips to the Jersey Shore when I was a kid, I've always been attracted to the heat and excitement of the grill. When I was a young chef just starting out, I always wanted to work the grill station. When I got lucky enough to open my own restaurant in 1991, I called it Mesa Grill, and the word "grill" first started to get hooked up with my name. The connection of Flay and fire had begun. And then the Food Network called. I started with the Food Network back in 1996 on a pretty basic show called Grillin' & Chillin'. It was just two guys grilling (me and a friend named Jack McDavid); one city style, the other country style. A few years later, a new show, Hot off the Grill, let me cook for my friends (indoors, this time). And now there's Boy Meets Grill, where finally I get to grill in the city (not in Manhattan, but right across the river in Queens). I get to show off my New York and the great ethnic cuisines, ingredients, and markets it has to offer: Chinatown, of course; Astoria, Queens (for Greek food); Arthur Avenue in the Bronx (for old-style Italian); lower Lexington Avenue (better known as Curry Hill, for Indian); the flavors go on and on. From barbecue to pizza, Argentine asados to Jamaican jerk, summer vegetables to tandoori to Peking duck, everywhere I go, grilling is there. Grilling in America used to be about hot dogs, hamburgers, and lighter fluid. But now anything goes on the grill -- if you like it, you can grill it. You can scatter a dozen whole clams on the grate of a hot grill to steam in their own briny juices; you can simmer chicken, sausages, and mussels in a big pot; you can grill pizza dough for the crispest, tastiest crust; you can add a little smoke to the sweetness of peaches and nectarines by roasting them on the grill for dessert. The question isn't "Can I grill this ?" but "Is there any reason not to grill this?" Usually the answer is: Go ahead and try it! Grilling is the best way I know to keep cooking fun and adventurous. Of course, Boy Gets Grill is the sequel to Boy Meets Grill, but it has a direction all its own. The new recipes are even simpler and quicker, to reflect how busy life is now. I still want to cook for my friends and family, and grilling fits into that better and better. In fact, most of the home cooking I do now starts with turning on the grill. Thanks to my hungry friends and my trusty grill, I've realized that grilling isn't just for weekends and parties anymore. The recipes in this book are meant to be easy to make and (pleasantly) challenging to your sense of taste. They are full of the flavors, textures, spices, and ideas that have shaped who I am as a person and as a cook. Some recipes are new combinations that (I hope) will become staples in your kitchen. Some are classics that are perfect when adventure seems a little more than you want. I hope you'll bring out this book whenever you've got your grill cranked up. 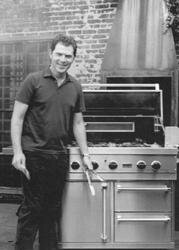 Don't hesitate to contact me with any grilling question you have at www.bobbyflay.com. As we all know, New York City has had some difficult days in the last few years, but the spirit of New Yorkers has never paused for a moment. I think the great food we have all over this city is one of the things that brings us together. That was very much in my mind when I was writing this book; I hope you can taste it in the recipes. Here are at least 125 reasons to light your fire. Most important, have a great time doing it and keep the flame alive. Bobby Flay is one of the most beloved -- and famous -- chefs in America. He is the food correspondent for CBS's The Early Show, appearing biweekly to report on food and cooking across America. In addition to his highly rated prime-time Food Network show Boy Meets Grill, his newest show, BBQ America with Bobby Flay, debuted in the summer of 2004. He is the chef-co-owner of two celebrated New York City restaurants, Mesa Grill and Bolo, which recently received a three-star rating from The New York Times, and is opening Mesa Grill Las Vegas in the summer of 2004. This is his fifth book.